If you’re shooting interiors with speedlites I probably don’t need to tell you how awesome the Slik SDV-20s (pictured left) are. If you’re not familiar with this tripod (used as a lightstand) or why it’s perfect for shooting interiors read this. There’s a small problem with the SDV-20, though – they’re no longer in production. If you can luck yourself into a used one on eBay or Craigslist it’s totally worth it. Since I’m neither patient nor tenacious enough to try and track down a used SDV-20 I did some research and found a really good alternative. The Sunpak 6601 UT is widely available and includes all the great features of the SDV-20 and then some! Like the SDV-20 it has a very small footprint, same basic construction*, and extends up to 58.3″ (the same as the SDV-20). The ~$18.00 USD price tag actually makes it cheaper than the SDV-20 was and it comes with an extra quick release plate, something that doesn’t seem like a big deal but if you’re like me you’re always losing small items so this is a nice addition. According to the B&H link they’re also including a carrying case (they didn’t when I bought mine so I can’t really comment on the quality/construction of the bag. If it’s like Slik’s – which I assume it is – it’s big enough to carry two stands inside and has an adjustable strap to sling over your shoulder). This is really handy when you’re already carrying a camera bag, a lighting bag and a tripod. *The only obvious difference in construction is the joint extenders. The latch to release the legs opens to the right on the Sliks and to the left on the Sunpaks. It took me awhile to get used to the new latches (truthfully, I’m still not really used to it and curse silently to myself every time I want to extend the Sunpak legs and realize I’m trying to do it the wrong way). It’s also worth noting the Sunpak’s quick release plate. Unlike the SDV-20′s, the 6601 UT’s tightening screw is a twist tab (I’m sure there’s a more technical name for it). Why is this awesome? You no longer have to carry around coins in your bag/pocket/car to tighten the quick release plates to your flash foot. As I’ve already established, things smaller than a tennis ball tend to disappear in my gear bags so trying to remember/find coins to tighten the plate down was, pretty much, a lost cause for me. Okay, so are you all convinced to run out and buy the Sunpak 6601 UT? Let me show you how to do a quick umbrella mod for it. Note: this wasn’t my brilliant idea. Someone from Scott’s FL workshop (identify yourself!!) did this to his lightstand and, I’m telling you, it’s BRILLIANT so I immediately modified all of my lightstands in the same fashion (and when I say “I immediately modified…” I mean I nagged Scott endlessly until he did it for me… sometimes I can be tenacious). A trip to the hardware store for some eye hooks (I think that’s what they’re called) and a drill (if you don’t have one already) is all you need.Screw in an eye hook on the tightening lever and one underneath the resting plate (it’s best to have an umbrella handy to make sure everything lines up properly). Line them up when the lever is almost completely tightened (this is important). Now you can thread your umbrella through both hooks and then tighten the lever to lock your umbrella into place. And that’s all there is to it. WordPress is compressing these photos but if you click on the images you should be directed to a larger, clearer version. Do you have your own crazy, time saving, brilliant gear mods? Hit me up in the comments! I have couple of these, but I also carry a couple real light stands as well. I like the fact that the light stands can go above normal ceiling height for some of those big atrium style rooms. If I need more height I just handhold one of the lightstands above my head. They're really light, even with an umbrella attached. Killer. I'm going to link to this on my blog. Wait til you see what else I have planned for my blog!! LOVE this! During the Chicago workshop, Scott talked about using ball-bungees to attach the umbrella to the tightening lever, which is what I do now. This looks even better. Keep the brilliance coming! Hello Luke both are good choices imo, and shulod be even pretty close from a price point. The Nikon has a more advanced AF assist beam with dual-beam construction so it covers also lateral AF sensors whereas the Yongnuo is focused in the middle. If you're shooting a lot of action that will be an advantage. On the other side Yongnuo have put a nice package together that will be more than sufficient for hobby use. Great tip, will get the drill out. Thanks for sharing. Happy New Year to you! Thanks, Charles! Hope you're having a great start to 2011!! Sorry, I'm not following... I shoot with multiple remote lights, too (have nine in my bag)... why would shooting with multiple lights prohibit you from holding the stand above your head? I do it regularly. This really is the perfect solution - actually better than the SVD-20 in several ways, particularly the price. Well done, Campbell! Nice! Now you're going to drive the price up on Amazon, though . . .
Can you attach an umbrella adapter to these stands? No, but if you do the easy umbrella mod you don't need the umbrella adapter. You can get a standard umbrella bracket on these - but you need a female to male 1/4" stud to thread onto the stud in the quick release plate. But -- the eyebolt mod is infinitely better, keeps the flash closer to the center of the umbrella, weighs less, easier to deal with all around. Hmm. 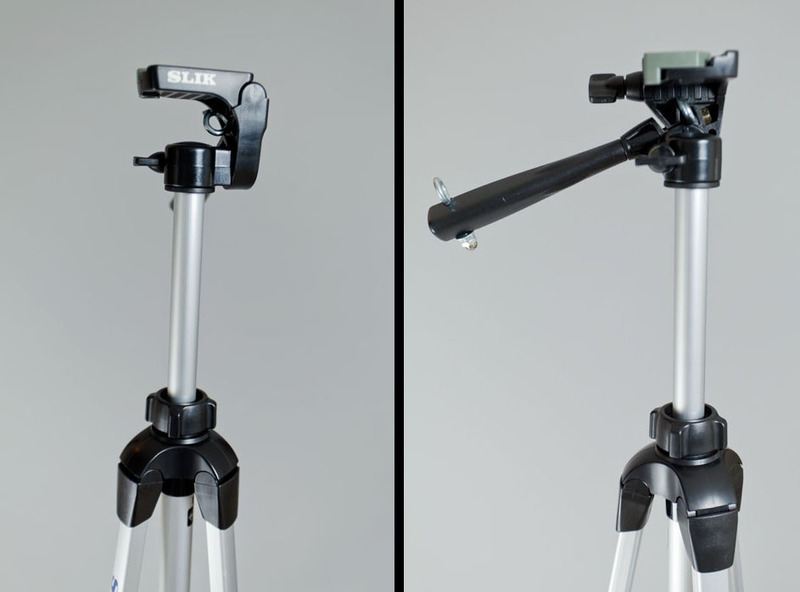 I looked at some Sunpak lightweight tripods a while back, and they did not seem that well built. Ended up getting some lightweight Velbons, which did seem decently built and relatively sturdy for this kind of use. Slightly heavier and slightly more money. May need to take another look at the Sunpaks. If they are lighter and still decently built, less weight would be nice. Well they're definitely no Gitzo but considering how little weight you're putting on them and that, really, they don't even need to be very precise they're a good bang for the buck. I'd never use one for a camera bigger than my iPhone but for holding flashes and umbrellas they're perfect. And, like I said in a previous comment, at the $20ish price point it doesn't really bother me much if they break. I may have missed it but how do you attach a flash to the plate?? I'm so used to sliding a flash into the holder..... ? I use the Nikon AS 19 flash feet. The bottom has a screw hole to attach the light stand quick release plate. maybe I'm crazy but I like mounting a flash with the trigger on a monopod. I say crazy because the flash has already taken a fall a full extension (about 5ft) the 2 plastic tabs that hold the battery door in place broke off so now the door is held shut with a ball bungie but it works like a charm getting light into odd hard areas. The Soligor T145 is about the same design as the sunpack in this article that goes for $29.99 and $19.99 when its on sale. That pretty much limits you to one off camera flash, though, right? 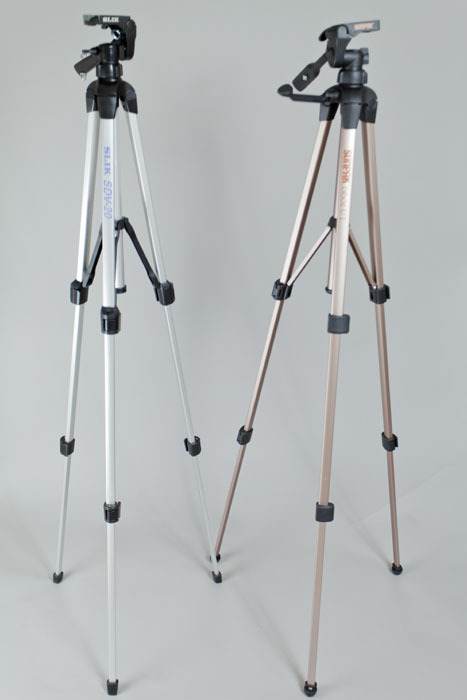 Malia, Hi, I recently purchased a few of the Sunpak tripods you mentioned. And, I like your idea of attaching eye bolts to the tripod, but I can't figure out where you attach the eye bolt under the resting plate. Thanks for any helpful advice. Really enjoy subscribing to your blog. Sorry for the delay in response! It goes right under the the mount where you clip in your quick release plate. You can see it in the example on the left: http://maliacampbellphotography.files.wordpress.com/2010/12/img_8510-copy1.jpg Make sure you have an umbrella handy so you can line up where the eyehooks need to go. Good luck! Malia, Thanks for responding. I'll give it a shot. You mention that the max height is 58.3″. Is that with the legs pulled in or spread? I've found a Slik model that has a listed max height of 51.8". Thanks Malia. Hi Barry! That's what SunPak advertises so I'm guessing that's with the legs fully extended. I'll check when I get home tonight and let you know. 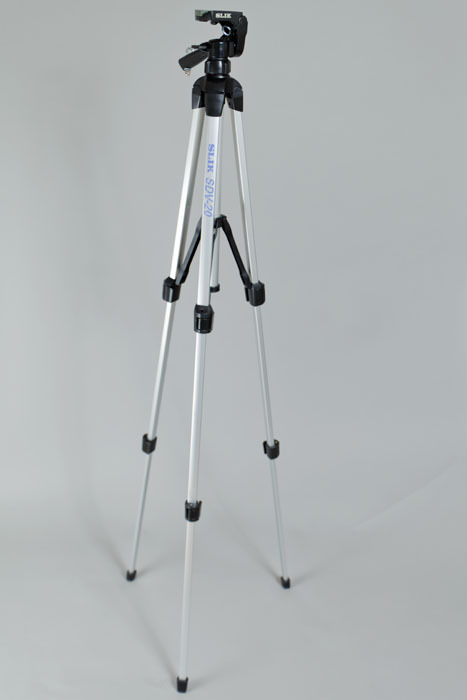 This is the link for the Slik tripod I was mentioning: http://www.bhphotovideo.com/c/product/790632-REG/Slik_617_143_F143_Lightweight_Aluminum_Tripod.html I wonder if having a 6" less is a big deal for interiors? Do you and Scott generally have yours fully extended? I think I have a few of those. They're not very tall so I find when I use them I'm holding them above my head a lot. Or standing them on dressers, tables, etc. You can't beat that price. After your great recommendations, I purchased a couple of the Sunpack 6601u's. It looks like the eyehooks won't quite line up them because the head is a little different than the Sliks. Have you mounted them on the Sunpacks yet? I notice the pictures are for the Slik. Darrel, I purchased a couple of the sunpak's Malia mentioned and I was able to mount the eye hooks as pictured on the Sliks. Thanks for the info Cheryl. I ended up having to get 2.5 inch eyebolts to make it work to clear the head. Seems to work ok. I bought two of them also,(6601's) and have to return one because some piece of plastic inside a leg fell apart and the leg just drops out. Hopefully, it's not a common problem. I have a couple of my Sunpaks modified but I didn't measure carefully enough so the flash sits askew (the base plate sits at a 45 degree angle). It still gets the job done, though. Malia, You're welcome. Mine also sits askew, but, like you said, it gets the job done. I also used 2 rubber gaskets (plumbing supply) and drilled their holes slightly larger to fit on the umbrella stem. I have one rubber gasket sitting in front of the eyebolt that's attached to the tightening lever and the other rubber gasket sits behind the eyebolt of the tightening lever. I had to come up with this solution because the eybolt I purchased was just a little too large for the umbrella stem and the umbrella was not staying in place if I placed the umbrella too much on an angle. If anyone is interested, I took an iphone photo of the set up with the rubber gaskets, but not sure how to upload to this blog. Hey Cherly, I have the same problem, I'd would be thrilled if you'd email me your pic of the gasket. frodar@gmail.com Also, I used 2 1/2 in eyebolts with a nut on the inside. Only at certain angles does it bump the head. Darrel, I emailed you the iPhone photo. 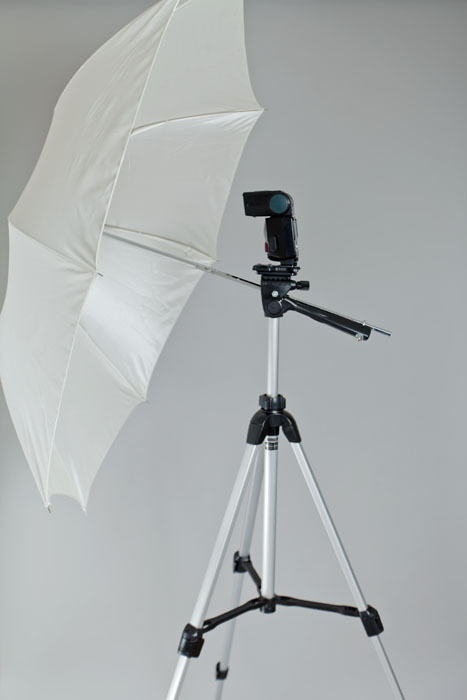 For those who have made their way over to this post because you want to know how to attach that pesky little umbrella to the lightstand, you're in luck! We've just added a 5 1/2 minute tutorial demonstrating how to do it to our video series, LightingforRealEstatePhotography.com. Click the link if you haven't registered yet. If you have already registered you can find the video at the end of the Insolita section! Hi Cheryl - off the top of my head, I have no idea. I just took my umbrella to the hardware store with me to find the right fit. Malia, Thanks, Scott suggested the same thing. Brian Stefaniuk on The big announcement – Lighting for Real Estate Photography instructional videos! © 2013 Malia Campbell Photography.